My plan was always to follow Hope’s Peak immediately with a sequel. When I signed with Thomas & Mercer, it was a two-book deal. So when the editorial process for Hope’s Peak was finished, I began the process of plotting the sequel that would become Storm’s Edge. I knew from the get-go who the villain would be in this book. And I knew that I wanted to give a lot of background to that character. I spent some time in Hope’s Peak, hinting at the corruption in the police department. 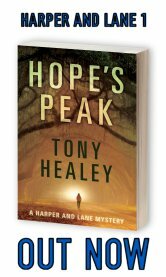 Some reviewers of Hope’s Peak were confused that some plot threads didn’t get resolved by the end of the book. Well, that was always intentional. For some of the things I wanted to do in Storm’s Edge, I had to lay the groundwork in Hope’s Peak, which meant ending a mystery novel with a . . . mystery. I wrote a draft of my outline and sent it to my editor at the time, Jacque Ben-Zekry, who then gave me her feedback on various aspects of the plot. One of her primary areas of focus was the book’s antagonist—ensuring that they leapt off the page. As I recall, there was a lot of notes and ideas getting sent back and forth, to ensure we got the villain right. I believe we managed to do that. Through the editorial process, we shifted the focus of the text so that readers didn’t know who the villain was. I wholeheartedly agreed with the suggestion, as it added an extra layer of mystery to the novel. There was a lot of thought went into making the book’s antagonist a well-rounded character, and we added aspects to him/her that will resonate with readers, given the current political climate. 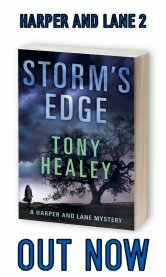 Storm’s Edge picks up a few short months after Hope’s Peak, and both Harper and Ida are in different places when we find them again. Harper is pregnant and faced with the prospect of becoming a single parent. Meanwhile, Ida is haunted by her communion with Lester Simmons in the first book. If Storm’s Edge finds its audience, I hope to revisit Jane Harper and Ida Lane. For those curious as to my plans going forward, I have a third book outlined, and the first couple of chapters written already. Harper and Ida feel real to me, when I’m writing about them. I see them both so clearly in my mind’s eye. Storm’s Edge is out now in multiple formats, and I sincerely hope that you enjoy it!